Laconia Bike Week in New Hampshire has long been considered the oldest motorcycle rally in the world, with over 90 years of history to show for it. For decades, motorcycle enthusiasts and bikers have used Laconia Bike Week as a ride in rally to make new friends, while enjoying the various events and forms of entertainment, including live music, bike shows, tours, and contests. This year is no exception to the greatness; from June 14 to June 22, 2014 Bike Week in Laconia will celebrate 91 years as the country’s leading motorcycle rally. • Limit your alcohol intake. Keeping the number of alcoholic drinks below three or four will lessen the effect of alcohol on your body, and will also take a shorter amount of time to wear off. • If possible, have someone who is alcohol free with you. If you need to go somewhere but you are still under the influence, this person can act as a designated driver. • Wear brightly colored clothing when riding at night and keep your headlight on. Make sure that your headlight is maintained and working at all times; this is a required law in most states, including New Hampshire. • Never swerve in front of another vehicle or bike and avoid aggressive riding. Aggressive riding is the number one cause of motorcycle related accidents and injuries in the United States. • Pay close attention to intersections and always slow down before approaching one. Quite a few motorcycle accidents have occurred from other vehicles crashing into motorcycles from intersections, especially left turning vehicles. Always keep in mind that vehicles that are crossing the intersection are expecting cars, not motorcycles. If you are injured in a motorcycle accident and it was due to what you believe to be a negligent driver, contact an experienced motorcycle injury law firm in New Hampshire . Always look twice and obey the speed limits and have your motorcycle inspected and checked for safety. The Motorcycle Accident Lawyers at Tenn And Tenn, P.A. wish all our fellow bikers a safe and wonderful time in Laconia. • Shuttle Service: Shuttle service for concerts will be available on Sunday, June 15th, at 6pm until the concert ends, Thursday, June 19th between 6pm and 1am, and Friday, June 20th and Saturday, June 21st between Noon and 1am. 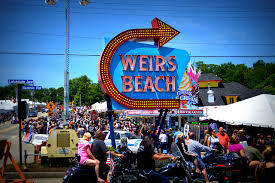 • Weirs Beach Boardwalk: The Weirs Beach Boardwalk is open between 8am and 9pm. • Rally In The Valley Rides And Events: The Rally in the Valley Rides and Events includes guided scenic rides between Sunday and Friday, along with live music and promos between 8:30pm and 11:30pm every night. • Laconia Roadhouse: The Laconia Roadhouse is an entertainment tent that is open at 10am.